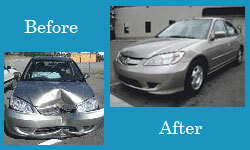 Welcome to Collision Specialists of Inwood's website. Our repair facility was established in 1987 by Rich Conte. I started my facility on a shoe string and a dream. My goal was to produce the best collision repairs possible at a reasonable price and to make our customers our friends for life. Because you will be driving home our reputation, we want to offer unparalleled customer service to those who have been in a collision. The way we figure it, our customers have already experiences enough stress, so we want to strive to make the repair process painless. We are now in-business for 30 years at the same location and have not only increased our customer base with our original customers, but are seeing the next generation of family members. Since our inception, I have added my three sons to the business, Rich Jr., Nick, and Anthony. A large part of our business is from referrals, but we also do direct repair work for various insurance companies. All our technicians are I-Car Certified and our shop is an I-Car Gold Class facility. This is the highest ranking you can receive as a Collision Repair Facility. We are also ASE Certified and welding certified. Our painters have gone to Atlanta, Georgia to be certified by Spies Hecker Paints. They have been through hands-on training so our paint work is second-to-none in the industry. We are also a member in good standing with the Better Business Bureau. Our Customers Keep Coming Back! This Auto Shop is the best that I've been to. My bumper was damaged due to an accident on my 2017 accord so I decided to shop around for a new place since my last few shops were always late or expensive. I found this place on yelp and while they had great reviews I'm a major skeptic. Nevertheless, I decided to give it a try and I'm so happy I did. The price to fix my bumper was so good I did not even bother getting other estimates, and when I got my car back the bumper was fixed to perfection. I felt like I got into a brand new car. Not only was the job very well done, they also washed my car. I would definitely recommend this place and I 100% guarantee that you will leave satisfied with the results. The owner and his son made the process so easy and satisfactory from the minute I walked in. just wanted to let you know we do appreciate how hard you worked on our car. It is beautiful! We also appreciate the extras - you and crew know how to make a customer feel good about a bad situation. Thank you and know the extra efforts you did showed and is appreciated. My husband and I Are thrilled with the work you have done. Your work is beautiful! We are so impressed with the quality of your work and the courteous ,caring attitude from all of you. I Appreciated the red vinyl case you gave us at the end of the service that would hold our insurance cards and gives steps to do in case of an emergency. It has been a pleasure dealing with you. I have a five-year-old Honda pilot that my kids have trashed over the years. There was gum on the floor, lollipop sticks on the seats, and countless Gatorade's spilled in the second and third rows. I brought my car to Collision Specialists of Inwood to get it detailed is week. I was amazed at the job they did. It's like I just drove it off the lot. There are no signs of the mayhem that my kids caused, and it smells like a new car. I highly recommend getting your car detailed here! Thanks so much to your team for the great work you did to repair my Audi A4. In addition to getting my car back looking like new, I'd like to thank you for the impressive customer service that you provided to me along with Nick and Anthony. I'd also like to thank you for helping me navigate working with third and fourth parties involved in my car repair. Your assistance was greatly appreciated and will be remembered and shared with others." Great body shop! Really great work and the staff is incredible!! This was probably the best experience working with any auto body repair shop! It is an honest and family run operation. The work was done in a timely manner and Rich was very fair about pricing. I have repeatedly worked with this group and would recommend them to anyone in a heartbeat! A few years ago, my car was in a serious accident. The collision shop I have been using for over 30 years started ignoring my requests for updates. What it turned out to be was the job was too complex and they didn't have the right equipment to handle my problems. I had the car towed OUT of that collision shop and brought to Collision Specialists of Inwood. Sal and Rich were on it right away. They have the latest equipment and technology to handle all aspects of collision repair. Every question I had was clearly and thoroughly answered. My minivan came out beautiful. Every aspect involved in the collision or affected indirectly as a result of the collision was taken care of. All of their technicians are top-notch, professional, polite and helpful. I proudly and confidently recommend their services to anyone who is in need of any aspect of car restoration, collision repair, painting, etc. I am tremendously satisfied and I know anyone who uses them will be too. "I was shaken up from the accident and they guided me through every step...Thank you"
These guys are great - they will come to wherever you are to check out the car and gave me the best advice - CALL THEM FIRST if you have an accident! I went through the grief of another body shop holding my car hostage. Rich was great and helped me out from start to finish. I joke that i won't mind getting in another accident because then I will make these guys my first call- top notch. Thank you! I recently brought my Volvo XC60 to Collision Specialist of Inwood. When I spoke to Rich Conte I got a very good vibe just by speaking with him. My vehicle was brought in on Tuesday morning and I picked up on late Wednesday afternoon as promised. All I could say is "WOW" my vehicle was beyond perfect (showroom condition). I recently had a fender bender accident and my front bumper was scratched up, dent on fender and hood had to be re-aligned. My entire vehicle was detailed (that was so nice and not charged extra for this service). I also had deep scratches on other parts of my vehicle which were polished out 100 percent. Finally, when I got into my vehicle there was a little plastic bag hanging from the directional signal which had touch-up paint in it and a pamphlet in a plastic sleeve on my console (describes do's and don't if involved in an accident). I like that, nice touch! I am so happy and totally impressed with their workmanship. Rich is honest, reasonable and a great guy to deal with. I am a very detailed person/picky. I highly recommend this shop in a minute!!! Thank you Rich and Staff for the Superb Job!!! PS This shop also pick-up's your vehicle and delivers vehicle back to you (nice and accommodating). "Rich was kind enough to come to my house and estimate the damages. He picked up the car and delivered it back when finished." "I thought my car was beyond repair but they made it look brand new in 5 days." "I did not have collision on my car and they worked out a payment method that made it affordable...you guys are the best." "I couldn't get my car started after the accident. Sal sent a tow truck to pick-up my car and he came personally to pick me up. What a great service."